ALTERNATIVE APPAREL owner, area resident Greg Alterman. Larchmont is ringing in the New Year with a host of new shops and restaurants to warm the spirits and tempt the palate. Vintage-style comfort is on the racks at Alternative Apparel, 219 N. Larchmont, where clothes aren’t just about looking good but feeling soft and fabulous. Worn in, well made come to mind. 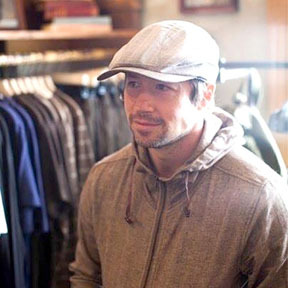 Owned by Hancock Park resident Greg Alterman, this is his second shop after his flagship store in Venice. “For me the location was a no-brainer. The Larchmont neighborhood is a perfect mix of trendsetters and young families,” says Alterman, Alternative founder and chief creative officer. The 2,200 square foot space, designed by Daniel Gonzales, is decorated with recycled and found items and exemplifies its logo: alternative culture and lifestyle. “Our plan is to open a store each quarter for the foreseeable future in key cities, but most importantly, in the right neighborhoods throughout the United States,” says Alternative chief executive officer Evan Toporek. “Seasonal Southern California comfort food” is on the menu at Lemonade, set to open at 626 N. Larchmont Blvd. Jalapeno bacon mac ‘n cheese, coconut curry chicken, soups, salads and desserts round out the menu. And, lemonade, of course, is poured at chef Alan Jackson’s 11th location. Under construction at Beverly and Larchmont boulevards, Larchmont Village Chipotle is expected to open in late March. The new space will feature exposed natural materials, custom-designed furniture, and natural lighting. Burritos, bowls, tacos and salads are made with fresh house-made salsas and made-from-scratch guacamole. Ole! Relax and detox at Shape House, aka Urban Sweat Lodge, 434 N. Larchmont Blvd. The 55-minute treatments can be spent in meditative pose, or opt for a headset and watch a movie or listen to music. Either way, you’ll clear your head, dream and release toxins and calories building up a healthy sweat. Essentials for face, body and hair abound at (Malin+Goetz), 238 N. Larchmont Blvd. The grapefruit cleanser and vitamin e face moisturizer are among a product line from this New York company based on natural, simple and multi-task products. Scented candles include the popular dark rum and geranium leaf. Boho-chic, casual and stylish wear can be found at Havoc, at 560 N. Larchmont Blvd. Clothing brands such as Saint Grace, Tysa, C&C California and local Hollywood-made brand Gypsy 05 and Gypsy Junkies are all sold here. Scarves, hats, wraps and jewelry round out the inventory. Elegant, feminine, high-end, trendy, but affordable! wear is at Growze Los Angeles, 234 N. Larchmont Blvd. The boutique’s striking décor shows off faux leather pants, chiffon flowing skirts and girlie minis. Jewelry and accessories and platform shoes too. Hamburger Hamlet XP, 217 N. Larchmont Blvd., serves its tried-and-true lobster bisque, a perfect meal to enjoy by the fire. And don’t miss the beef, turkey and veggie burgers. Oh, and the onion rings, garlic fries and shakes. Transform your home with expertise from Devall Design Home, 562 N. Larchmont Blvd. Susan Devall has specialized in improving interiors 17 years, calling on European and Eastern traditions and her travels for inspiration. Landscape and custom built pieces from furniture to windows and fixtures are also among specialties of this Norton Ave. resident.